Last year marked the first year for the MetroLink holiday train in St. Louis, and we are proud to present the 2nd Annual Holiday Magic Train, brought to you by Metro and the Convention and Visitors Commission (CVC) of St. Louis for another holiday season! The Holiday Magic Train is a partnership with the CVC to promote public transit, as well as the Holiday Magic event in America’s Center December 2-4, and the holiday spirit in St. Louis. 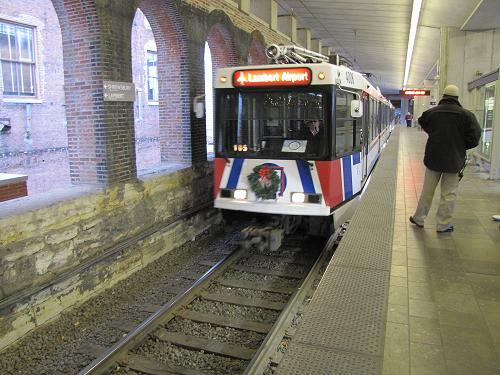 Last year, we heard wonderful comments from riders and Metro employees who enjoyed traveling on the festive train which was adorned with blue and silver Fleur-di-lis snowflakes. This year, the Holiday Magic Train will again travel on both the Blue and Red Lines from 4:30 a.m. to 6:30 p.m. Monday through Friday, and 10 a.m. until 7 p.m. on select Saturdays and Sundays. 4:30 a.m. – 6:30 p.m.
Saturdays 10 a.m. – 7 p.m. Operates from 10 a.m. – 7 p.m.
MetroLink will operate on a holiday schedule on these dates. This year, 88.1 KDHX will also present Rhythm & Rails, the on-board concert series for its second run this year, December 17-18. Details coming next week on the bands and concert schedule. To all Metro riders and St. Louis community members and visiting families, we wish you a very warm and enjoyable Thanksgiving, and magical start to the holiday season! We’ll see you on the Holiday Magic Train! Hey. I can sing. So let me know what days I can sing on. I would love to ride the Holiday Express train and sing carols. Plus, I have a CD player with Christmas Carols played on a pipe organ. I am available on Wednesdays and Fridays to sing. Also on a Friday, I might also be playing at the City Museum. And anybody including the staff at Metro wants to see me play the organ at the City Museum, patrons are adviced to change to MetroBus route #97 or MetroBus route #99.